Our second day in Kyoto was a whirlwind temple tour. We did the famous walking tour that starts at Kiyomizudera, a huge temple on the side of the mountain. It’s the definitive temple for it’s style and paved the way architecturally for other temples. The fun part of the walk is all the narrow streets and cool little shops. Bev bought a Kimono, but other than that we skipped all the tourism in favor of our timetable. Back at the Ryokan, Mrs. Uemura made us a fantastic American style breakfast, we packed our bags, snapped a shot with her, and jetted to a few more temples, which are all only a few blocks away from her place. We made it to Ryozen Kannon with it’s huge white buddha. Right next to it is Kodaiji Temple. The highlight of this temple was the gardening. On a hillside as well, the many buildings are connected by lots of steps and walkways. The trees are so well pruned. 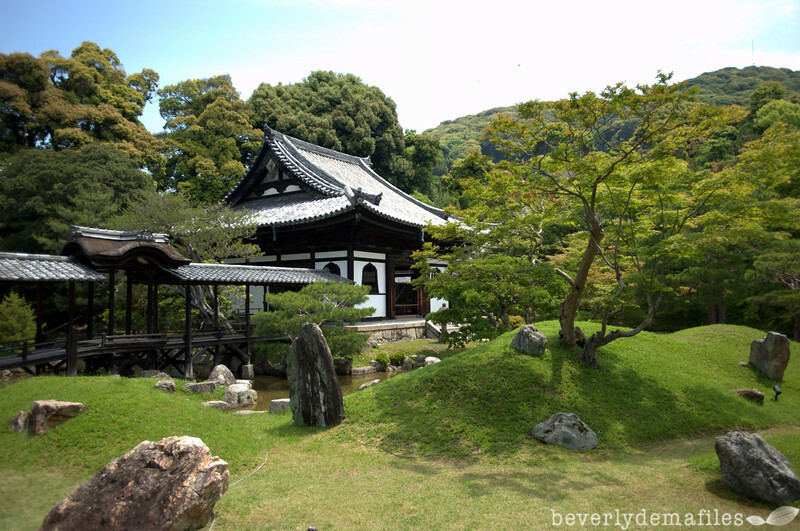 There are Zen rock gardens. And, there is a bamboo forest. Very cool. We heard they light it up at night during the summer. Wish we could have seen that. There was time for one more temple before the bullet train back to Tokyo. Choin-in temple is HUGE! The property as well as the temple itself are enormous. I read that it’s size reflects the popularity of it’s particular approach to Buddhism. We witnessed a ceremony of some monks and got to see the New Year’s bell there. It weighs 14 tons and takes 20-odd men to ring it every New Year. 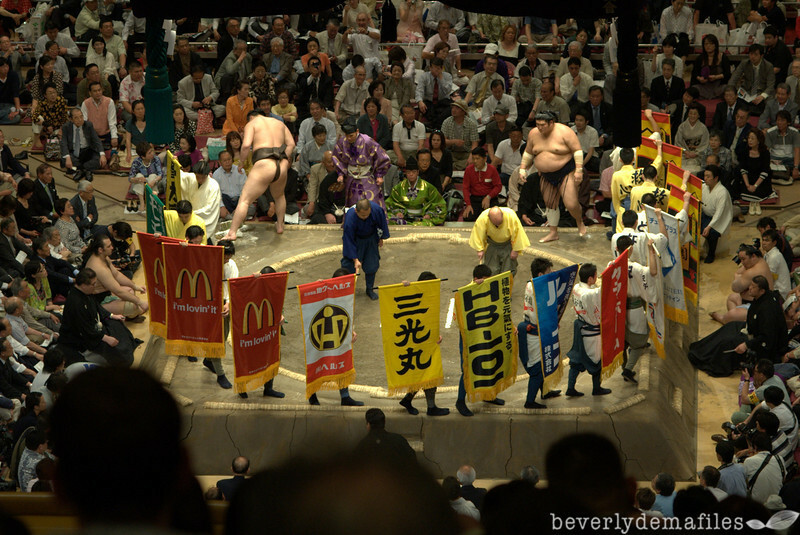 We barely made the train back to Tokyo, ate lunch on the go, but made it back in time to meet Simone at the Sumo tournament. It takes place 4 times a year and we were lucky enough to be there. It was pretty amazing. Those dudes are strong. We had nosebleed seats and Bev was missing her big zoom lens, but nonetheless it was impressive. After the Sumo, we were hungry, but also wanted to see Shibuya Crossing. It’s a famous intersection where several streets come together and the concept of crosswalks goes out the window. Totally fun to buzz through the mayhem. We stopped at a Starbucks only for the aerial view of the intersection where we ran into some Aussies on holiday. Claire is also a graphic artist, so she and Bev talked for a bit. I was starving so we eventually left in search of food. The streets in the Shibuya district are like a maze, but we managed to find a little teriyaki bar, Yaki Suka. The food was great and the Asahi refreshing. There were probably only ten seats in the place, but you could tell the locals like it after work. 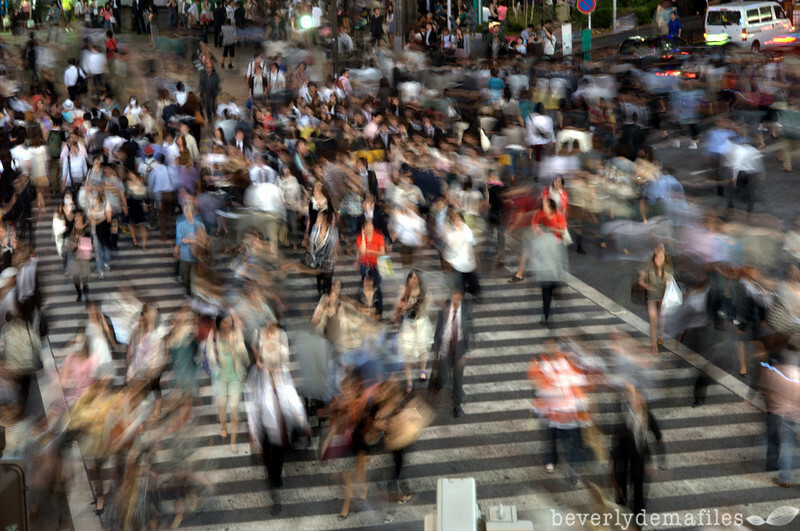 From there, we decided to wander through Shibuya some more and absorb the scene. Lots of teens, dressed super hip. Lots of shopping. Tons of lights. Very much like New York’s Times Square. Hopefully, the photos do it justice. It was stimulating. Anyway, we were exhausted. We hit the rail back to our neighborhood with Simone, bid our farewells, and checked into our Capsule. 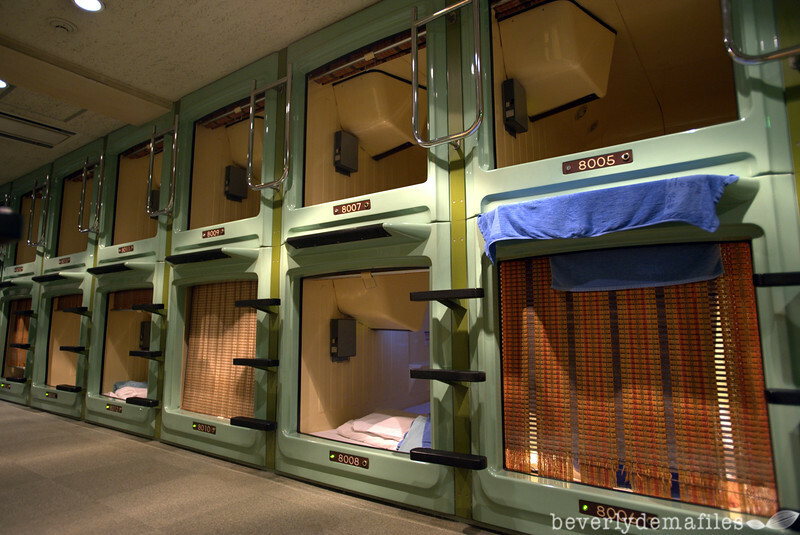 Bev had to sleep on a separate floor for women. Basically, there are several floors with sinks and toilets and a door to a room with stacked capsules. Bunkbeds almost, except you enter from the head/foot. I hit the sack because we had to get at 6am to shower and make our flight to Thailand. Another long post, but hopefully you all enjoy the detail. Thailand to follow. Wow wow wow. My first post overseas! So much has happened already. Today felt really long.Â First of all, they don’t call it a bullet train for nothing. 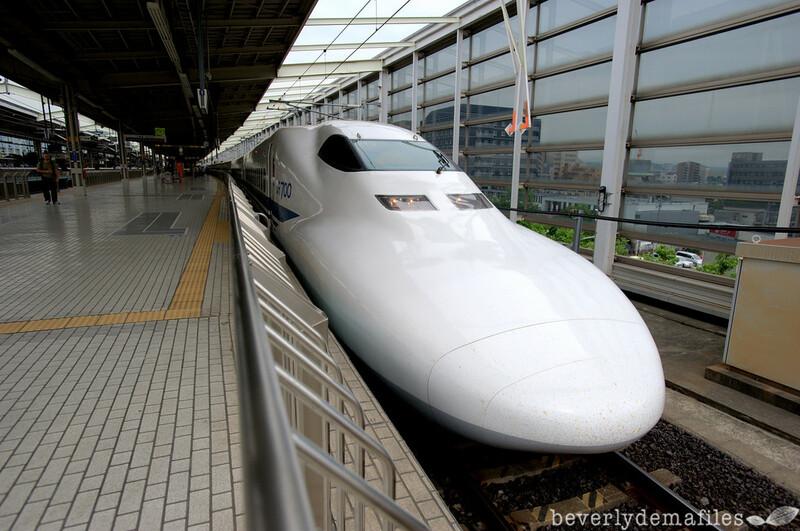 It is actually called the Shinkansen…doesn’t it just sound faaaaaaaast?! Most of the people who took the Shinkansen were Japanese business men, who by the way, are always sharply dressed. The bullet was amazing. We saw Mt. 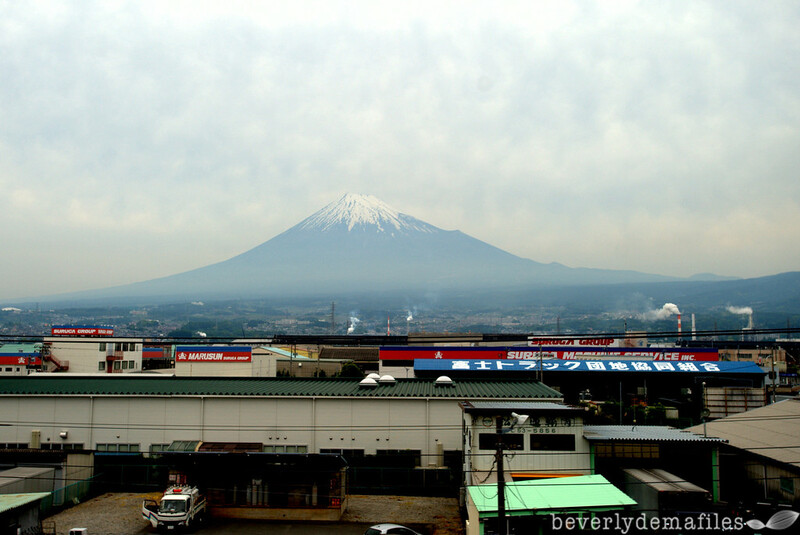 Fuji whizzing by at 130mph. Really cool! We arrived in Kyoto and stayed at Ryokan Uemura in Southern Higashiyama. There were only 3 rooms in the whole place, and it is really like staying at your grandmother’s house. Mrs. Uemura set up everything in our room, which is all tatami flooring with paper screens and everything! Our room looked out into a small garden with bamboo, rocks, and a small shrine. We hung out for awhile then wandered around for a bit around the neighborhood. We were lucky enough to get a glimpse of a few geisha walking by the Yasuka Pagoda. It was such a unique experience that I almost felt disrespectful taking out my camera. I snapped off one shot while they were walking by, and it wasn’t even a good one! In retrospect I probably should have not cared and taken a lot of photos and just passed myself off as a dumb tourist who didn’t know any better, but I really just couldn’t do that. Forgive me! I am not an opportunist. This quality actually makes me a bad photographer, but whatever. It just felt weird. We moved on and walked around Gion on Shimbashi Dori, past all the fancy bars. They were so many of them, stacked one by one on top of each other, 5 stories high. It is interesting to see so many modern bars right in the heart of this ancient city. But such is Japan, a place of many dichotomies. We decided to forgo the fancy pants restaurant that everyone recommended in favor of a little Japanese BBQ joint down the road. It was really good, and I had a funny battle with the automated toilet. The toilet lid opened automatically when you locked the door. This took me off guard and I thought I was going crazy, so I had to lock and unlock the door a couple of times to make sure it was actually doing what I thought it was doing. I couldn’t figure out how to flush the toilet because, of course, all the buttons were in Japanese. I left the washroom as it was, embarrassingly asked our server how to flush the toilet, then ran back upstairs to finish the deed. The owner of the restaurant laughed as she figured out what was going on. I hope she thought it was cute funny and not dumb American tourist funny!